Copyright protects: original works of authorship (published and unpublished) — literary, dramatic, musical and artistic works. Copyright does not protect: facts, ideas, systems or methods of operation. It does not protect words, phrases, symbols, or designs identifying the source of the goods or services. For ideas, systems or methods of operation, think patent! For words, phrase, symbols or designs identifying the source of goods and services to distinguish them from others, think trademark! Your copyright portfolio can contain valuable IP assets. Don’t overlook them. We can help you develop your copyright portfolio and enforce your copyrights. If you have created an original work of authorship including literary, dramatic, musical, and artistic works, you have copyright protection in that work. If you choose to formally register your work with the Library of Congress, you will have additional proof of ownership, a public record of your particular copyright.​ You will gain access to the U.S. court system to sue for copyright infringement, and you may record the registration with the U.S. Customs Service to protect against importation of infringing copies. Copyright licenses can help you legally use someone else’s copyrighted material or collect a negotiated fee from a third-party for the use of your copyrighted material. Either way, it makes good sense to know your options. 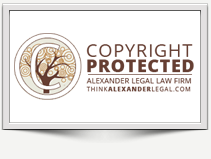 Our copyright law attorneys can draft your copyright license in a way the best meets your expectations and requirements. While it does not always make sense to assert a copyright infringement claim, our Atlanta team of copyright lawyers can advise you when it does make sense. We will evaluate the legal merits of your case and assess the likelihood of prevailing at trial. While we will always make every effort to resolve your copyright dispute in private negotiation rather than in court, if you ultimately need to go to trial, our copyright lawyers can assist with a referral to a well-qualified litigator.